8X10 acryluc paining on Canvas. 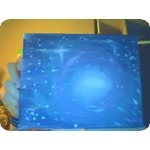 Painting of the galaxy. Comes from a smoke-free environment. Free Shipping.